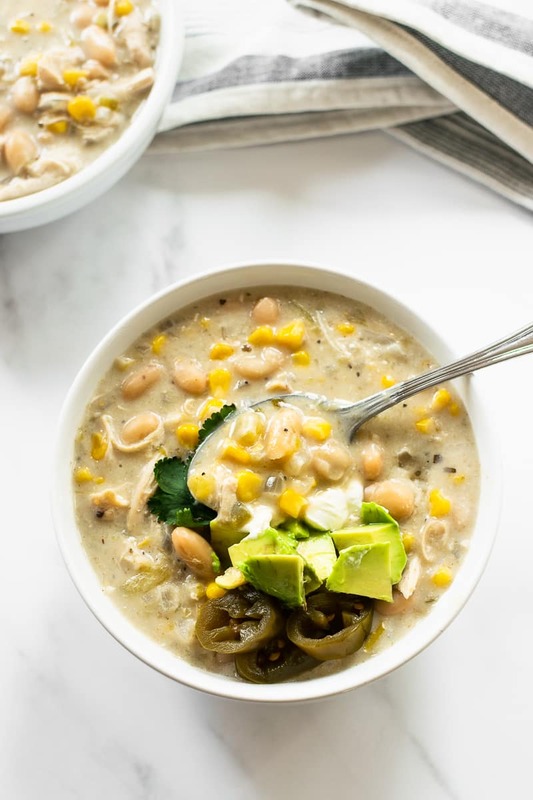 This slow cooker verde chicken chili is homemade, full of flavor, satisfying, and easy to make. 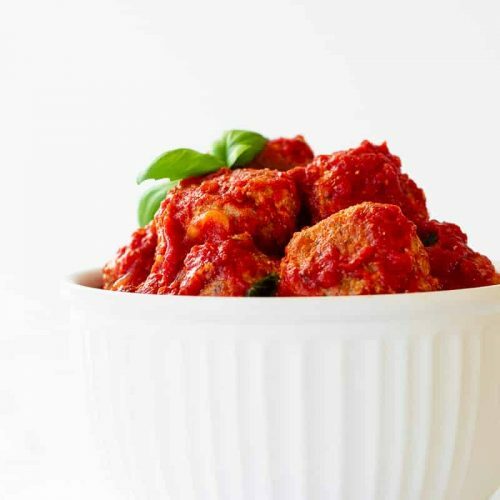 Add all the ingredients to the slow cooker and dinner is done when you get home! 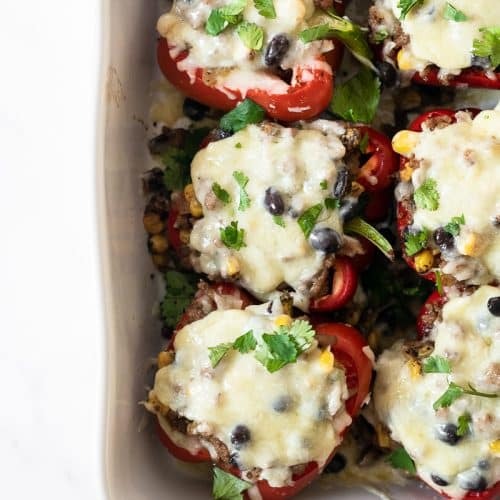 Get creative with your toppings or use what you have on hand! Here’s the chili recipe that I was raving about a few weeks ago! It’s the meal that I gobbled down, by myself, in just 2 days. Not ashamed at all to admit that either. I know, I know. It’s not winning any awards for looks but stick with me here. Looks can be deceiving — this is an absolutely incredible chili recipe. It started from a combination of random food that I had in the pantry and refrigerator. I grabbed thawed chicken, leftover onion and jalapeño, cans of beans, a hidden can of green chilis, a half open jar of salsa verde, half a bag of frozen corn, and a tiny bit of cream cheese. I tossed in some bold spices, let it cook for 7 hours and here we are today with now one of my favorite dinner recipes. The other week I made this chicken chili again and was reminded why I love it so much. 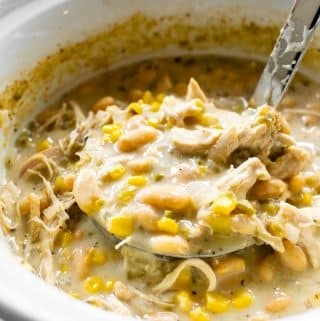 Not only is there juicy pulled chicken, beans, and corn in each bite — each sit in the creamy spiced goodness soaking up every ounce of flavor. Beans: The beans help thicken the chili as it cooks and gives it a heartier texture. I used great northern beans this time, but feel free to use what you have on hand. I’ve also used pinto, garbanzo (chickpeas), cannellini beans. Corn: Gives a little texture variation to the chili. Jalapeño: While adding flavor, it also adds a little spice to the chili. Feel free to omit if spice isn’t your thing! Green Chilis: These aren’t really spicy, but more add another depth of flavor throughout. Salsa Verde: So many levels of flavor within salsa verde. Garlic + Spices + Lime: Each add even more flavor! Cream Cheese: Adds creaminess and evens out the spice level to the sauce. It’s simple — after all, it is in the name. It’s really just 3 steps. Let me teach you how to make it. Add the ingredients: You’ll add in all the ingredients except the cream cheese to the slow cooker. Give it a big stir, put the lid on, and walk away. 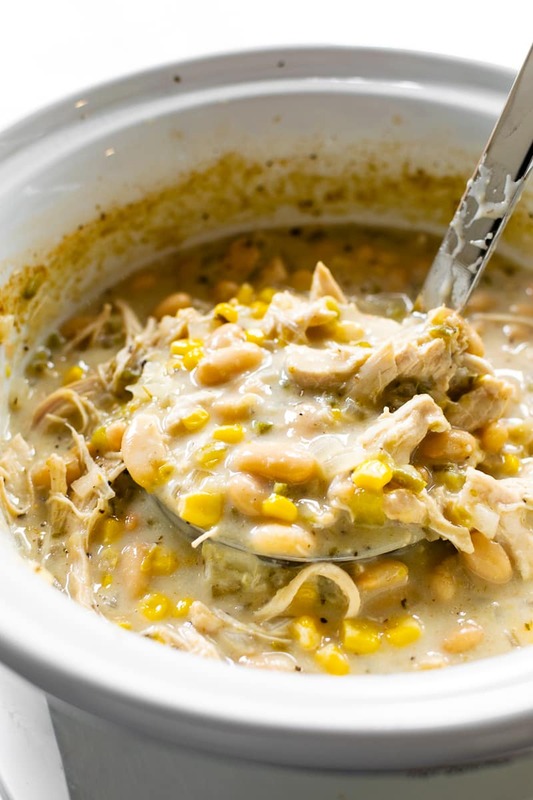 Shred the chicken: Remove the chicken, shred or chop, and then add it back in the slow cooker. Mix together the cornstarch and water in a small cup. Add all the ingredients (including the cornstarch mixture) except the cream cheese to the slow cooker. Give everything a stir as best you can to mix. Cook on low for 6-7 hours or high for 3-4 hours. Remove the chicken and shred into pieces, then add the chicken back to the slow cooker, and give it a big stir. Stir in the cream cheese until fully melted. Cover the slow cooker and cook for an additional 10 minutes. Serve warm topped with fresh cilantro, shredded cheese, avocado, and/or chips. Store leftovers in a container in the refrigerator for up to 1 week. Reheat as desired. Freezing Instructions: This chicken chili freezes perfectly. Allow the chili to cool, place in an airtight container or bag and store in the freezer for up to 3 months. Thaw overnight in the refrigerator and heat as desired. 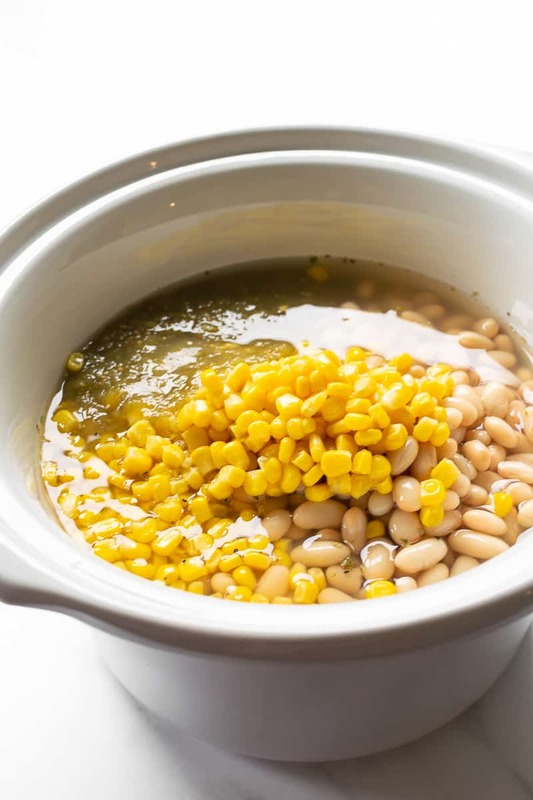 Make this vegetarian: Simply omit the chicken, add in an additional can of beans, and use vegetable broth. 1. Chicken: You can use either breasts or thighs for this recipe – as long as it’s about 1.5 – 2 lbs total. 2. Jalapeño: If you like a bit more spice, feel free to leave a few veins/seeds. 3. Beans: I used great northern beans but feel free to use what you have on hand in any combination. I’ve also used pinto, garbanzo (chickpeas), and cannellini beans. 4. Corn: Either can or frozen corn can be used. Do not thaw if using frozen corn. 5. Chicken Broth: I prefer to use low-sodium chicken broth (it’s easier to add salt than remove!) Reduce the salt if using regular chicken broth. 6. 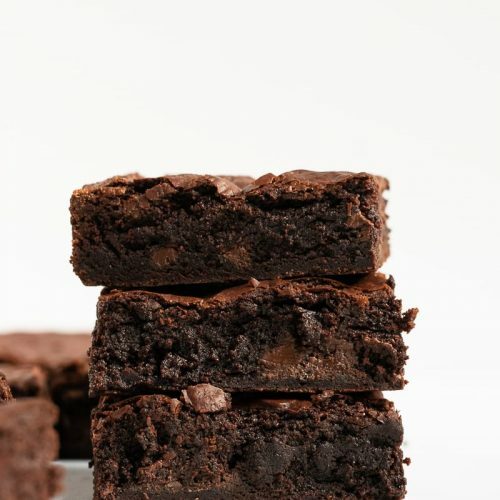 Cream Cheese: The brick style works best. It can be omitted all together, if needed, however the chili won’t be as creamy.